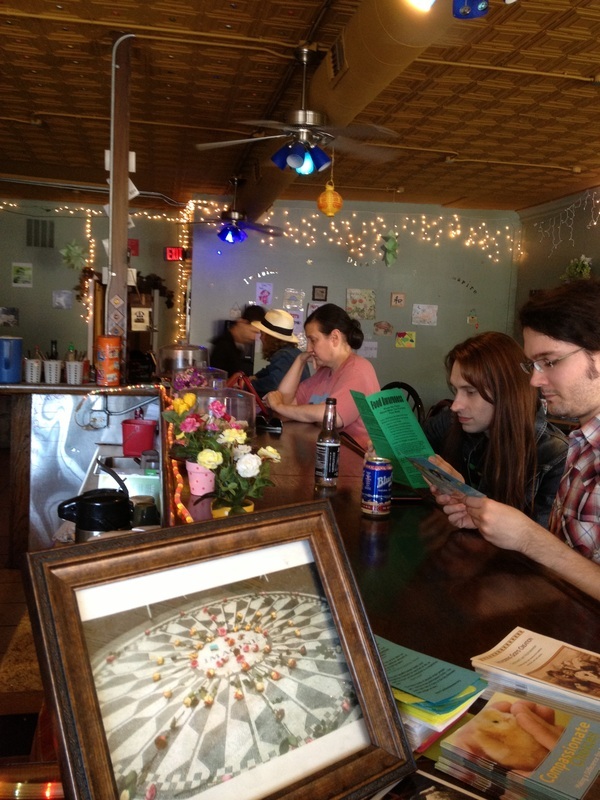 Patrons enjoy an afternoon at the bar while reading animal protection flyers in Imagine Vegan Café. Cooper-Young’s only vegan-friendly café may be looking for a new home after its landlord decided not to renew the restaurant’s lease. Imagine Vegan Café owner Adam Jeffrey said he has given vegetarians and vegans alike a place to enjoy a meal, snack, or a drink in a friendly, welcoming atmosphere since opening in April 2011. The café is located in a building near the intersection of Cooper and Young Avenue, and shares the building with other businesses. One of the spaces within the building has already been vacated, and Jeffrey said he fears Imagine Vegan Café could be next. The building was once occupied by Casablanca Café, which specialized in Moroccan cuisine. Once it closed, the building was vacant until Jeffrey took over the lease and opened his restaurant. “I remember the building being vacant for a while after Casablanca left,” Jeffrey said. “Cooper-Young was the location we really wanted. Imagine Vegan has a variety of meals and drinks with all-natural ingredients, and of course, containing no animal products or by-products. It’s one of the very few restaurants in Memphis that have an all-vegan menu. Gary Brown was in town on vacation from Alabama looking for a place to eat a vegan meal, and Imagine Vegan was first on the list. “I just looked up ‘vegetarian restaurants’ online and this came up,” he said. No matter what happens with his lease situation in Cooper-Young, Jeffrey said, he hopes to keep serving customers.